Views of the Susquehanna River free buffet breakfast and luxury bedding make a room at the Hampton Inn Harrisburg-East (Hershey Area) a sought-after commodity. The 145 upscale well-appointed rooms in the five-floor property include wood paneling luxury bedding with fluffy comforters and free internet. Some suites have living rooms and kitchenettes. 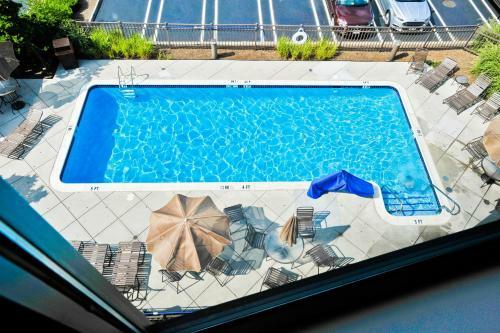 There are attractively landscaped areas and ample free outdoor parking plus a warm lobby an outdoor pool with a sundeck a fitness room a business center and complimentary beverages. The Hampton Inn Harrisburg-East (Hershey Area) is four miles from City Island Park five miles from the Pennsylvania State Farm Show Complex and eight miles from City Center. Harrisburg International Airport is also eight miles away as is Hershey Chocolate World and Hershey Park. Gettysburg is 35 miles from the hotel.